But that doesn’t mean we have to go without! Yup! It’s time for another overdrawn Visio Network shape, like the Logitech VX Revolution Mouse Shape, the Thinkpad Network Shape. or the USB Stick Shape. Since it’s Easter Sunday, and things are slow around here, I was in the mood to create something pretty. And of all the new gadgets on the market, few are prettier than the sensational Apple iPhone and the Apple iPod Touch. So for you Apple fans who still use PCs, and for you die-hard Windows fans who appreciate a bit of sarcasm, please enjoy the Apple iPhone Visio Network Shape. Below is a view of the shape in all its glory. I was trying to be cool, like PowerPoint 2007 and create a neat SmartArt reflection-effect. Needless to say, this was WAY harder to do than I thought it would be, but like I said: it’s a slow day. You can leave comments at the end of this article on how Cool this is, and “oh my God!”, etc. The shape behaves like a standard Visio Network Shape. It has text that can be repositioned by a control handle. It has a connection point at its center. 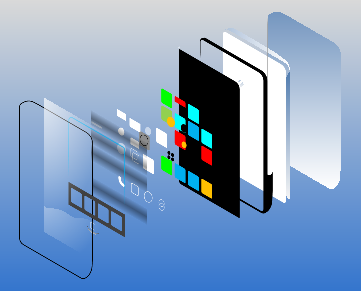 It has the standard data fields that you find on Visio network shapes, behaves well with the Visio Legend shapes, and behaves well with Themes. You should be able to add it to your Favorites stencil (File > Shapes > My Shapes > Favorites) and be diagramming your department’s cell-phone network in no time! When creating “over-drawn” shapes, I like to at least make them as efficient as possible. That means getting rid of unnecessary grouping, and combining shapes with like-formatting into single shapes. We hope you enjoy this addition to your Visio network shapes! Great work, Chris. I really like the exploded view. It would come in handy optimizing the rest of our network shapes as well. Thanks Visio Guy! It was exactly what I was looking for. Nice work! Can we get a version of your shape that will let us put other shape inside of the screen. 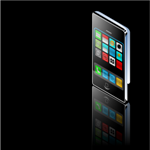 This way with the new Apple Iphone SDK we will be able to design app. Do you already have your own oblique-angled artwork for putting inside the group? Look in the sidebar under “Meta”. There you’ll find “Register” and “Log in”. You need to register with the site to download this content. Quick question, When I create my visio drawing and try to print it out as .PDF, the iPhone graphic does not show up. The “phone” is there but the black screen and all of the screen icons are not. Anything special I need to do? Are you using the PDF exporter that you download from Microsoft as an add-on for Office 2007? For me it works “fine”, although the gradient fills don’t look so hot. It could also be related to printer drivers, but I can’t say for sure. One trick is to export the object as a png or jpg image, then print that out or copy it to a Word document, if that is what you are doing. ya, I ended up not needing a pdf version, so i just saved it as jpeg. I tried “print” to adobe pdf and the “convert” to pdf functions and neither worked. Its ok I got what I needed anyway. And thanks for the great graphic and help btw. Thanks Steve Jobs, for Apple IPhone! There is something funny about the face of the iPhone that won’t let it print. I tried to plot it and then print and neither worked. Just the shell of the phone. Plot was HP and print was Xerox. Very strange. I have been having trouble with printing transparency from Visio. Transparency makes it a lot easier to do cool effects, but unfortunately, MS doesn’t seem to have paid enough attention to it. The ultimate hack is just to export a drawing or shape as a high-resolution bitmap/image, then print that. That’s what I do when I create fancy business cards and take them to Kinkos for printing. There might also be some printer settings deep in your printer driver’s dialogs that will help. I still haven’t figured it all out. Visio guy – Thanks the great work! I did manage to export as graphic and then bring back into a drawing for print. I wouldn’t waste any time on this since there is a way around. It is strange. 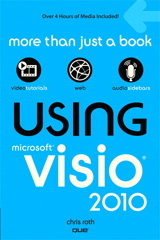 Just like the visio shape, we created one in powerpoint. 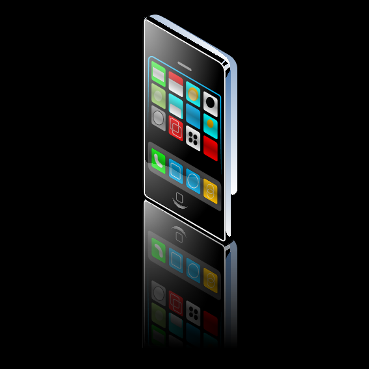 We set out a little contest, where we created an iPhone5 image, completely made by using only standard powerpoint shapes. Enter the contest and you might win the actual slide + a nice bonus.